UNEP FI round-up: developments and outcomes from the first week of the 2016 intergovernmental climate conference in Marrakech, Morocco (COP22) by Remco Fischer, Climate Change Programme Officer. Last year’s climate meeting in Paris, COP 21, has been widely praised as historic for two reasons: it was only the second time that world governments were able to craft an intergovernmental agreement on climate change based on national commitments to reduce GHG emissions and address the physical impacts of climate change. Secondly, unlike the first agreement – the Kyoto Protocol in 1997 – which comprised commitments only by a small minority of industrialized countries, the Paris Agreement now includes action pledges by the majority of countries around the world reflecting new more globalized economic realities, and the on-going rise of the world’s emerging economies as significant emitters of greenhouse gases themselves. The historic result achieved in Paris, and the positive momentum surrounding it, provide the context for this year’s COP in Morocco. The ratification of the Paris Agreement by such a large number of countries just two days before the start of COP22, and the fact that the volume of emissions these countries represent delivers a quorum, has boosted confidence. And to put some icing on the cake, a few weeks before COP, a group of wealthy, developed countries, published a roadmap detailing how they foresee achieving mobilization of USD 100 billion of annual climate financial flows for developing countries, a central pillar of the global deal. Lastly, positive news reached the COP from Europe’s largest economy. On Thursday, Germany published its 2050 climate action plan making it the first country to present a detailed long-term strategy to achieve almost complete economic decarbonization. The plan not only includes interim targets for 2030, broken down by individual sectors – power, industry, transport, buildings and agriculture – but also a long-term, 2050 target to reduce emissions by 80 to 95% relative to 1990 levels. This gives citizens, companies and investors the clarity they need. Germany also recognises its international responsibility making explicit reference to international climate finance in its plan as well as support for developing countries. The above are good reasons for optimism, but given the bigger picture, not for complacency. 2016 is set to be the hottest year on record following record-breaking years already in 2015, 2014, and 2013, with a disastrous El Niño and massive coral bleaching in tropical seas. Carbon dioxide concentration in the atmosphere passed the dangerous 400ppm threshold and continues to rise. While the country commitments that were pledged in Paris – more prominently known, in climate policy jargon, as nationally determined contributions (NDCs) – bend GHG emissions into a downward trajectory, we’re still not on a safe path. UNEP’s Emissions Gap Report shows that our climate curve remains on a pathway towards 3.4°C warming by 2100. It confirms that global emissions in 2030 will still be 25% higher than they should be for a 2°C trajectory. Also, the currently mandated commitment period, meaning the implementation phase, of NDCs is not meant to start until 2020 which risks that significant climate-incompatible investment decisions might still be made from now until then, such as in long-term infrastructure assets, potentially locking-in countries into equally climate-incompatible and hardly-reversible pathways. In the domain of financing, the key challenge that persists is that the large majority of international, public climate financing for developing countries continues to be channelled towards climate change mitigation (ie the reduction of GHG emissions) as opposed to climate change adaptation (building resilience to the meteorological and hydrological effects of climate change). This runs counter to previous agreements that the disbursement of financing for each objective should be equal. Another difficulty relates to the methodological challenge of tracking flows of private climate finance, especially those that are mobilised as a result of public financial disbursements. The current body of NDCs, therefore, is widely seen as a floor of commitment from which ambition needs to be raised in coming years. And to many, the Marrakech talks represent a key opportunity to start that process, and to make quick progress on what is one of the formal ratchet mechanisms – cleverly built into the core of the Paris Agreement – to that effect: the so-called facilitative dialogues. The facilitative dialogues are meant to give countries a chance to take stock of how close they are to achieving the key long-term goals of peaking emissions and achieving net zero emissions early in the second half of the century. They are designed to inform the next, expectedly more ambitious, round of NDCs. Once countries have a clearer idea of the direction of travel, they will have the motivation to either update or communicate their new NDC by 2020. The first facilitative dialogue took place in Marrakech on 11 November, with the next one being scheduled for 2018. It is not possible yet to provide an assessment on this first dialogue but more information can, for now, be found here. NDCs are important internationally because they clarify, albeit to varying degrees, the climate-related, mid-term objectives of each country and the anticipated means – policy and other – by which objectives will be achieved. In aggregate, of course, they also enable an assessment of the global temperature trajectory that, as a result, the world is embarking on at any given point in time. But the NDCs are also important nationally, in particular in relation to private sector actors, including investors and financiers, who ultimately will need to play a major role in making the `NDC implementation` happen. The positions taken, and messages conveyed over the last 12 months, by now US president-elect Donald Trump, are, against that background, creating uncertainty in Marrackech as to the role that the world´s second-largest emitter – at least at federal level – will play in the future on climate change, both domestically and internationally. UNEP FI works at the interface between governments and the finance sector, and has a critical role to play in the intergovernmental climate process. In Marrakech, we are focusing on two of these roles: promoting finance sector leadership and best practice on climate change, as well as clarifying the roles and requirements of private finance in climate change mitigation and adaptation. Climate action by non-state actors, particularly businesses and investors, is a key topic now in the global climate talks. The rationale is that if the private sector shows conviction, determination, and leadership on climate change, governments will be compelled to do the same. What then shows greater climate determination by investors than adjusting their core, maintsream portfolios to the low-carbon economy? Against that background, on 4 November at Climate Finance Day in Casablanca, Olivier Rousseau, Member of the Management Board of French public pension fund FRR, launched the Portfolio Decarbonization Coalition’s 2016 report on progress detailing how institutional investors have started adjusting portfolios worth over USD 600 billion. Download it here. On 8 November, an event organised by IPEEC (the International Partnership for Energy Efficieny Cooperation), the AOB Group, and UNEP FI, focused on how to mobilise at-scale financing for energy efficiency. 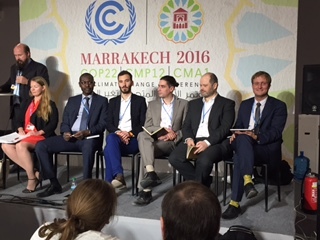 The event highlighted how the energy efficiency financing ambition and strategies of individual financial institutions such as ING, coupled with the leadership that, collectively, financial institutions have conveyed through the UNEP FI Statements on energy efficiency, can support intergovernmental policy processes such as the G20 Task Group on Energy Efficiency Financing. On 11 November a finance sector panel organized by UNEP FI, the Global Investor Coaliton (GIC), the Principles for Responsible Investment (PRI), and Carbon Tracker, highlighted the actions that Axa, Citibank, MN, Aviva, the New York State Comptroller and Deutsche Bank, are taking to both weather the new risks that climate change poses to the finance sector, as well as to capitalize on the opportunities presented by the climate economic transition. On 11 November a panel involving the UNFCCC, the Climate Policy Initiative (CPI), CDP, ISO and the 2 Degrees Investing Initiative, discussed and agreed on the need for a new, comprehensive, global standard on private climate finance to replace the only existing, but incomplete standard focused on so-called ‘carbon financing’ in the context of the Clean Development Mechanism (CDM). An issue that governments and negotiators continue to struggle with is how best to increase climate financial flows to transformational scale, which can only be achieved by mobilizing private finance. UNEP FI, through its Demystifying Private Climate Finance series, provides insights and guidance. The latest issue, launched in Marrakech on 7 November during a side event involving the German Federal Ministry for Economic Cooperation and Development (BMZ), GIZ, UNEPFI member Allianz, the Frankfurt School UNEP Collaborating Centre, and the Government of Antigua and Barbuda, focuses on the particularly complex and ill-understood challenge of adaptation financing. The new UNEP FI report can be downloaded here, and the event can be watched here. Find out what’s happening during the second week of COP22 here. Follow UNEP FI at #COP22 on Twitter and LinkedIn.